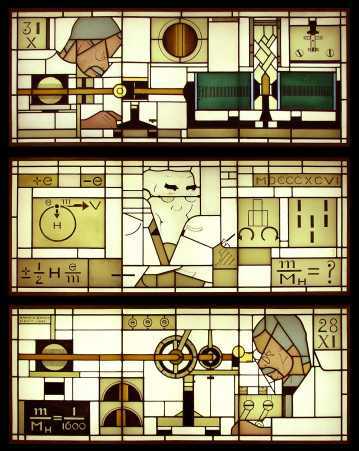 Stained glass windows by Harm Kamerlingh Onnes (a nephew of the physicist), depicting the experimental discovery by Zeeman (top and bottom) and the theoretical explanation by Lorentz (center). 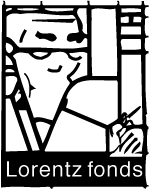 The logo of the Lorentz Foundation is abstracted from these stained glass windows. See more logo's at our logo contest page. It is often said that the electron was discovered in 1897 by J.J. Thomson. That is an oversimplification. The idea of an atomic unit of charge was probably formulated for the first time by Faraday in connection with his experiments on electrolysis. But this idea did not easily fit in with the notion of an electromagnetic field. Hendrik Antoon Lorentz modified and completed Maxwell's theory of electromagnetism. In his theory the electric and magnetic properties of matter are interpreted in terms of the motion of charged atomic particles. A magnetic field exerts a force on these particles, now called the "Lorentz force". In 1896 Pieter Zeeman, then an experimental physicist in Leiden, made a surprising discovery: the splitting of spectral lines by a magnetic field. Lorentz was able to explain the new phenomenon with his electron theory. He concluded that the radiation of atoms consisted of negatively charged particles with a very small mass. In 1902 the two researchers jointly received the Nobel Prize in Physics.